This page contains some samples of the more traditional types of window panels and installations that I have done. Designs can be taken from other artwork, click art, standard stained glass patterns, or photographs. They certainly add a lot of color and style to any home or office. Other applications not shown include transom and sidelight windows. If you are interested in these types of installations, please send me an e-mail. Prices are affordable, however it depends on the complexity of the design and the size of the window. Special photos and click art can also be used for designs for small hanging panels. 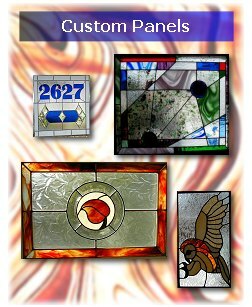 These panels make wonderful gifts and are very affordable. Simple panels cost about $100 per square foot. They come complete with hooks for hanging, and can often be hung in a window from a suction cup hook. If you are interested in something like this, send me an e-mail and I would be happy to work with you.